I have some pictures of Shoes here that im not sure about. It seems to me that the Sole Edges are not Correct and the Shell. More Pictures to Come. Would be welcome to hear some Opinions about them. In my limited experience - which is very limited. I'd say the general quality look substandard but could not say for sure. I only know the signs of fakes by reading the hints and tips on here. Are serial number same or diff for each shoe? Tiny tabs visible on heels? Etc. you should have a read of the forum a little more... Maybe somebody who knows might help if they are feeling nice. Is this supposed to be the first atmos Superstar? Like Bongosi here said they do look a bit substandard. Check the serials and post some more pictures, especially from back of the shoe. But with that heel klit, i'd say FAKE. Serials should be different I believe and little tabs on the heel not good. I'd also say fakes. Hmmm, well that make me sad ...... gladly i got a Pair of the GSNK-4 that im sure that it genuine. Have made some Dark light Pics. Very thanks u Guys took a look at them. Who sold you the fakes? Out them! Serials diff on each shoe on the white ones? Heel pics? Well i didnt bought them on Ebay. I getted them on a other Portal and tradet it Lokal. Guess i got a new pair for getting Dirty that doesnt matters me. 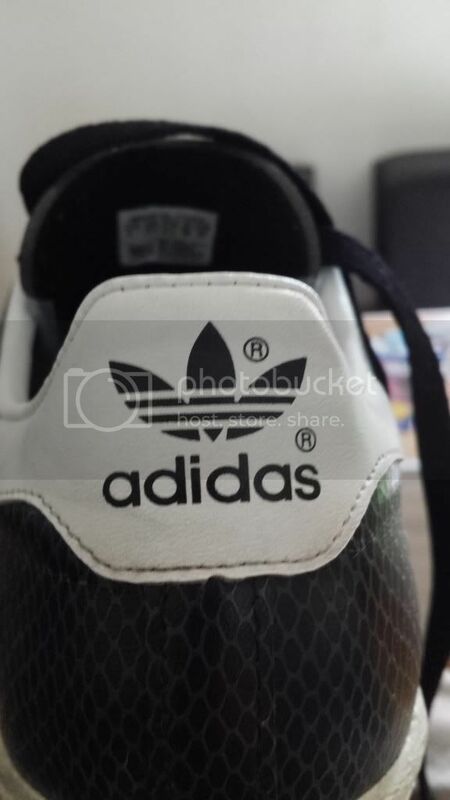 Whites are probably legit but like others said those blacks are definitely fakes. Serials have to be different in all shoes that's the best way to tell real ones from fakes. But remember that some fakes also have different serials. whites look ok from what little i can see, my whites are propa baggy, it annoys me, lol. but yeah unfortunately like the others say the black ones dont look good, also the adidas bit at the back is printed on not embossed like on yours. if you paid paypal can you get your money back?, not sure if that only works through ebay. Jeah, well my whites are baggy too. (Always wear them with very very thick socks). Well the Blues are about to drop in some days i heared. Does somebody know if Hanon will have them ??? I think the real point is that genuine Supes won't have the heel tag poking out. Not nessecarily the inverted tag though. I've run across many genuine pairs that simply had no tag at all.